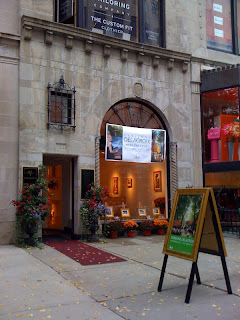 For people of all levels of art appreciation to go for public art openings and gallery events on and around Newbury St. I hope to chip away at the intimidation of our local galleries, and spark interest in bringing more people in to enjoy local art shows. I walk past Axelle almost everday being a frequent customer at L'Aroma Cafe. The large arched window always captures my attention with interesting pieces of work on display. A few weeks ago I was particularly taken in by an advertisement for a showing to be attended by the featured artist, Fabienne Delacroix. The event was excellent. The atmosphere was relaxed and the works were captivating in their simplicity. The artist made time for as many patrons as possible. Regrettably, I was unable to stay long enough to have a word with her, but I was able to speak with a few other guests. It was a very easy environment to fit into and chat about the many paintings and which rooms they would best decorate. One of the most impressive things about this gallery is its welcoming atmosphere. From the window, to the open door(weather permitting), to the friendly curators - it is effortless to walk in and enjoy the exhibits. If you are new to the gallery scene here in Boston, or just see something that catches your eye, I highly suggest popping in. You will be warmly greeted. I cannot wait for the next open event.